Dinghy sailors launch from the beach in front of the clubhouse to sail in Lyme Bay and are also able to enjoy the more sheltered surroundings of the River Axe. 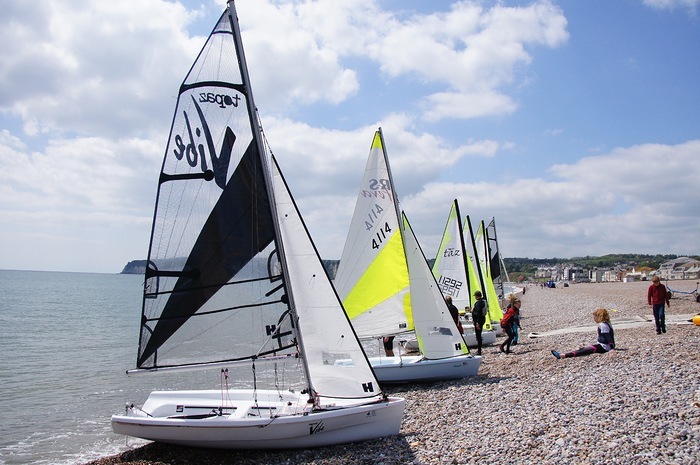 Members sail a variety of dinghies at AYC and the Club owns a number of training dinghies in the Topper Topaz range which are particularly suited to beach launch & retrieval. These Club training dinghies allow members who are new to dinghy sailing to gain some basic skills with more experienced dinghy sailors, before considering buying their own boat. There is a designated dinghy park area in the yard where members can keep their dinghies - members currently sail their own Vibes, Topazs, Toppers, Tazs, Solos, Mirrors, Lasers, Picos, Skows, Larks, Oppis and a Miracle. The Axe One Design (AOD) is a traditional 12 foot clinker built Bermudan rigged dinghy which was designed specifically for members of the AYC in 1951 and there are currently 7 AODs in the fleet (see Axe One Design website). In the post war years, dinghy sailing was the predominant Club activity, initially with the Axe One Design fleet and then with the Scorpion Class dinghy. In the early 1970s the Club fleet numbered approximately 30 Scorpions and the leading boats were also appearing at the top of the fleet in national and area championships. However, with the move toward single handers in the late 70's, the number of dinghy sailors at AYC dwindled and cruiser sailing became a more popular activity. Over the last few years, with the establishment of the Cadet & Family Sailing section, dinghy sailing at the Club has seen a welcome resurgence. There has been increasing enthusiasm for getting the younger members of the Club and their parents out on the water. In 2011 the Executive Committee decided to invest some of the legacy left by John Templeton-Knight in three RS Fevas for use by cadets. A 5-year strategy for developing family sailing at AYC was then put together in October 2012 and a number of second hand Oppi & Topper dinghies were purchased for use predominantly on the River Axe. An annual Cadet Activity Week during the summer holidays was introduced in 2013. Initially instructors were brought in from neighbouring centres for dinghy training sessions during the week, but increasingly we have been able to provide this training 'in house' with a number of Club members now trained as RYA instructors. Cadets & their parents have also had the opportunity to complete stages/levels of the RYA Sailing Schemes at neighbouring centres. In 2016 the Executive agreed to replace the old Oppi fleet with six new Topaz Taz dinghies as the Club's entry level dinghy for cadets. The Club was also awarded a Sport England grant for a project to encourage more adults & older teenagers to try dinghy sailing. With this grant, three training dinghies suitable for adults (two Topaz Vibes & a Topaz Argo) were purchased, enabling the Club to offer dinghy sailing taster sessions and basic training to adults & older teenagers as well as cadets. Following on from three very successful 'Push The Boat Out' open days, the number of families joining the Club has increased significantly and the number of adults (both existing & new members) wanting to get involved in dinghy sailing has also increased. 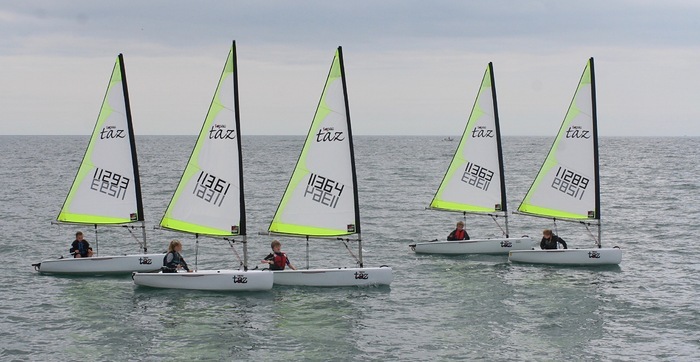 In 2018, the old Toppers were replaced with three ex demo Topper Topaz dinghies, which are suitable to be sailed by adults and cadets either single handed or two up. Saturday afternoon fun 'skill development' sessions were introduced in 2016. These are open to all Club members of any age, sailing their own boats or a Club training dinghy (subject to availability). More experienced dinghy sailors offer the less experienced support & advice and 'Try Sailing' taster sessions can be organised for first-timers who want to have a go (see Saturday Sailing). Everyone is expected to get stuck in and help with rigging boats, manning the support boats, and providing support with launch and retrieval. These sessions have grown in popularity, with a large group of cadets & adults sailing regularly from April to October, and the Saturday sailors are now gaining the confidence to join in Club racing on Sunday mornings. All dinghy sailors (adults & cadets) are encouraged to take part in the Club racing programme and many of the more experienced cadets are already showing the adults a thing or two! There is an expectation that those taking part in Club racing have an appreciation of the rules of the road and are confident in their sailing ability, but racing is an excellent way to improve your skills. Bay racing takes place on Sunday mornings from April to October, weather permitting (see Club Dinghy Racing). The River Race series has 12 races programmed for 2019. These are open to all classes of dinghy, with racing for both General Handicap and individual Class trophies (AODs, Skows, Mirrors & cadets) (see River Races). AYC has been a recognised training centre for a number of RYA shore based courses since 1974. In 2015 the Club also gained recognition from the RYA to run powerboat courses. As a result, we now have more members trained as support boat drivers who can support the family sailing activities and dinghy racing. In 2017 Dinghy Instruction was added to our list of RYA recognised courses. It is important to emphasize that the Club is not a commercial RYA sea school and therefore does not offer dinghy training courses to non-AYC members. Being a dinghy sailing RTC allows us to certificate the courses we run for our members. If a suitable course is not available at AYC, members are encouraged to complete stages/levels of the RYA National & Youth Dinghy Sailing Schemes at nearby centres.